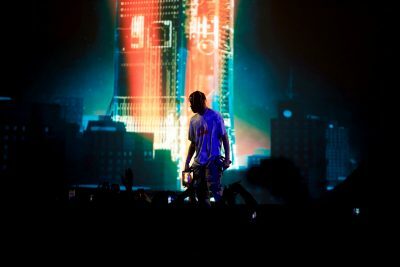 Before Travis Scott even set foot on one of his two stages Sunday for his “ASTROWORLD – Wish You Were Here” tour, everyone in the crowd knew that they were in for a wild ride. With a Ferris wheel on one end, a portal-like, round screen on the other and a rollercoaster up above, TD Garden was transformed into the defunct Six Flags theme park of Scott’s childhood in Houston, Texas. The rapper performed for a sold-out arena, and he ensured every single person was having a good time, from the nosebleeds to the mosh pit. Scott, ever the maximalist, had not one, but three openers including Sheck Wes, Trippie Redd and Gunna. All of them gave electrifying performances sans stage theatrics, but that’s not to say they didn’t add their own bit of flair with their undeniably wild stage presences. Wes got everyone up on their feet screaming along to his hits like “Mo Bamba” and “Live Sheck Wes” while he practically defied gravity bouncing around the stage. Trippie cranked things up about 20 more notches with his unstoppable energy. After finishing his set, he leaped straight into the crowd, flying squirrel-style. The crowd barely had time to process the three banging openers before it was time to experience the main attraction. A promotional video set the scene with images of children screaming on roller coasters, flaming infernos, desert wastelands, science-fiction fembots and even a child version of Scott. The rapper, clad in his very own merchandise, caught everyone by surprise when he rose from the opposite stage. The mosh pit roared below as he opened with “STARGAZING.” Smoke cannons, fireballs and strobe lights created a dizzying effect throughout Scott’s extravaganza of a performance. For “CAROUSEL,” Scott decided to take a literal route as he spun around on his very own Ferris wheel — few lucky members of the crowd got a turn, too. “I just want to take you all on a ride with me,” Scott explained of his theatrical spectacle of a show. His mission was most definitely accomplished. Since ASTROWORLD as a concept is essentially an ode to the amusement park where Scott spent his childhood summers, it only seems logical that he would incorporate some of this nostalgic mood into his show. Scott decided to disrupt the madness briefly to show off his vocal skills in songs like “90210” and his verse in SZA’s “Love Galore.” After these more mild-mannered songs, Scott announced that he was going to take everyone on a trip to his city. If this segment of the show was the slow crawl up the rollercoaster, then the rest of his performance felt like the pure rush of speeding down the big drop. Gunna returned to the stage for Scott’s “YOSEMITE,” and the crowd went wild as they witnessed the two rappers combine forces. Scott professed his appreciation for the city of Boston at various points during the show. He reciprocated the love from the crowd by making an onstage costume change into a customized Boston “ASTROWORLD” T-shirt. He proceeded to dedicate “goosebumps” to all of Beantown and its crazy representatives present in the arena. For the last track in his 32-song set list, Scott performed his most recent chart-topper, “SICKO MODE.” As the song played out, Scott descended on a platform into the depths of the stage while fireworks exploded around the Garden. Ending with such a dazzling bang comes as no surprise with a performer like Scott. Scott is undoubtedly a force to be reckoned with as a performer. His energy and passion were on full display throughout the whole concert, which kept the pulsing crowds enthralled during his dark and dizzying amusement park-themed show. Scott set out to take everyone on the ride of a lifetime at his very own reimagined AstroWorld, and he did it in the most exhilarating and extravagant way.